HomeHomepage Features, News2019 Molten Series Expands! Exciting News for the Twin Cities Junior Volleyball Scene! 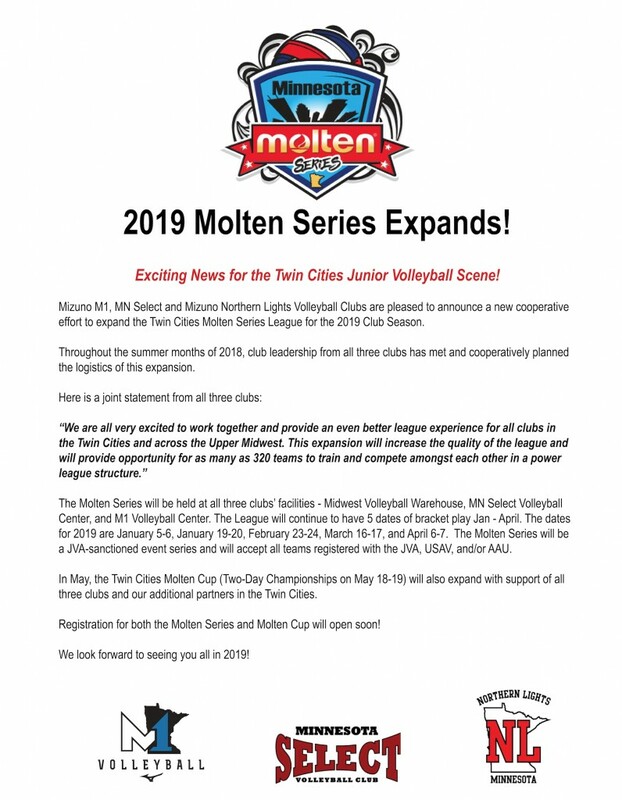 Mizuno M1, MN Select and Mizuno Northern Lights Volleyball Clubs are pleased to announce a new cooperative effort to expand the Twin Cities Molten Series League for the 2019 Club Season. Throughout the summer months of 2018, club leadership from all three clubs has met and cooperatively planned the logistics of this expansion. The Molten Series will be held at all three clubs’ facilities – Midwest Volleyball Warehouse, MN Select Volleyball Center, and M1 Volleyball Center. The League will continue to have 5 dates of bracket play Jan – April. The dates for 2019 are January 5-6, January 19-20, February 23-24, March 16-17, and April 6-7. The Molten Series will be a JVA-sanctioned event series and will accept all teams registered with the JVA, USAV, and/or AAU. In May, the Twin Cities Molten Cup (Two-Day Championships on May 18-19) will also expand with support of all three clubs and our additional partners in the Twin Cities. Registration for both the Molten Series and Molten Cup will open soon!